Videogame animations are one of the most neglected areas in the entire field of animation reviews. Lots of money rides on the success or failure of video games, some of which have high-dollar opening weekends that put almost all movies to shame. Inevitably with these animations, it is the same story: great animation that is usually cast in caves or at night or in space or deep inside castles or towering churches or wherever else it is dark and there are lots of shadows to hide the unreality of it all; feverishly fighting heroes or heroines or whatever-they-are who either brandish swords ("cut-ting tools" as der Arnold would say) or lasers; and, most importantly of all, almost no story to speak of other than our character has to find something or get somewhere or defend him/her/itself. It's just a lot of fighting and killing and killing and fighting. This animation gets a perfect score on all counts. The animation is captivating, but it is so dark you can barely see what is going on. There are all sorts of cutting tools, lots of blood, and, well, a battle. No story. Just our hero robot taking on the usual room full of thugs. Our hero (for those who don't know about Minecraft) is Herobrine. He is a ghost with an attitude. The other assorted characters who inhabit the mine don't like Herobrine, or at least resent all the attention that he gets from being the center of "Minecraft." They've come to pay Herobrine a little visit and introduce him to their little friends. But Herobrine, he don't want to go nowhere, Jake. And so we have... "Gods Don't Die," above. Below is the first part, from 2012. It is not as good, by which I mean to say that the animator has improved with time. I sure hope that Dillon Gu, the talented animator who makes these as fan projects, doesn't spend two entire years on each one! But if he does... it is time well spent. A continuation of Gods Don't Bleed. 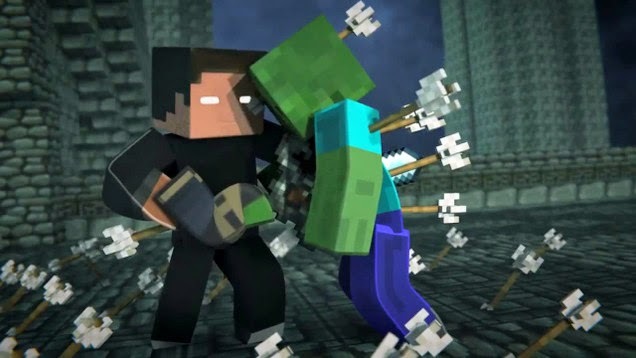 Now that the mobs believe Herobrine is not a god and have seen him bleed, more and more have joined the cause. The rebellion has spread and our Herobrine faces an ever growing threat of dethronement.